Frozen T-Shirt Race - Icebreakers, Icebreaker Ideas, Games, Activities! The Frozen T-Shirt Race is an ideal game to be played outside on a hot summer day, and is a hit amongst younger players. 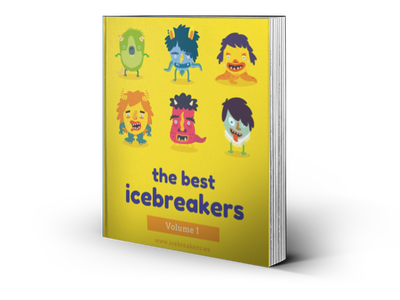 It’s a true ice-breaker game, as the players will work together to literally break the ice on the t-shirt. The game’s objective is simple—you must thaw out, unfold, and wear a frozen t-shirt. Even though this game might sound easy, it’s a challenge to complete. The Frozen T-shirt Game can be played in groups or each player can receive their own shirt. Setting restrictions on how the t-shirt can be thawed will make the game more competitive, and you can really see players getting into it! Place each t-shirt in water—about two cups—and wring it out. Too much water will prevent the t-shirt from thawing in a reasonable amount of time. After the t-shirt has been wrung out, fold it neatly into a square, so that it fits inside the freezer bag. Once the shirt is folded flat, press it to squeeze out the remaining water. Place the shirt in the bag, seal it, and lay the bag flatly into the freezer. If you are playing the game at different location, then use a cooler filled with ice to keep them frozen. Don’t reveal the game to the players’ prior, so that they will have to come up with the ideas on the spot, without getting an unfair advantage. Assign the teams or individuals and pass out the frozen t-shirts. You don’t want more than 4 or 5 players on one team, as it will get too crowded. The goal is for each player or team to use whatever he or she can to thaw a t-shirt enough to wear it. Whoever gets their t-shirt on first wins! Their body must be completely in the t-shirt including head and arms, so that it’s worn normally. All players must stay in the game area—the game area can be marked off prior to starting. No water or other liquids can be used to thaw out the t-shirt. No machines such as a microwave, heater, dryer, etc. can be used to melt the ice on the t-shirt. No sharp objects can be used on the t-shirt. The t-shirt must remain intact and not destroyed in anyway—no holes, tears, etc.